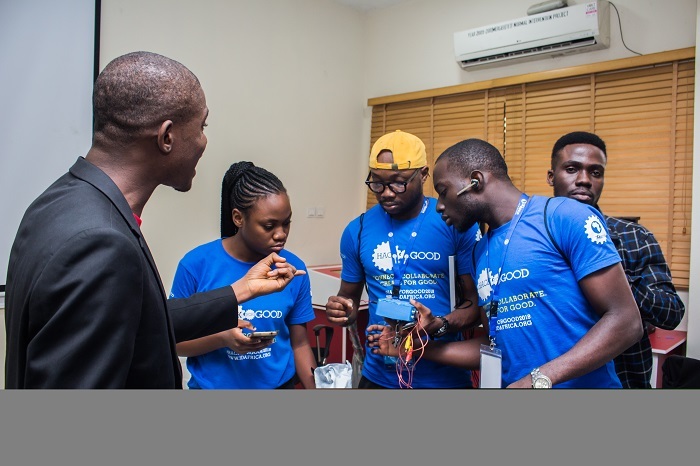 he Youth for Technology Foundation (YTF) recently hosted it’s annual 3D Africa HackforGood event, a design and prototyping challenge, from Thursday, August 2, 2018, to Saturday, August 4, 2018, at the University of Lagos. 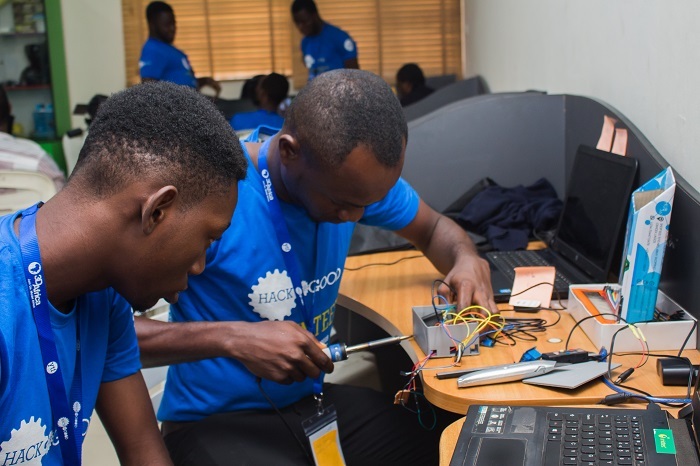 For three days, 50 young hackers from across Nigeria comprising students, recent graduates and early-stage entrepreneurs, were given access to cutting-edge technology, mentoring and instruction to develop functional prototypes to address issues in their communities. 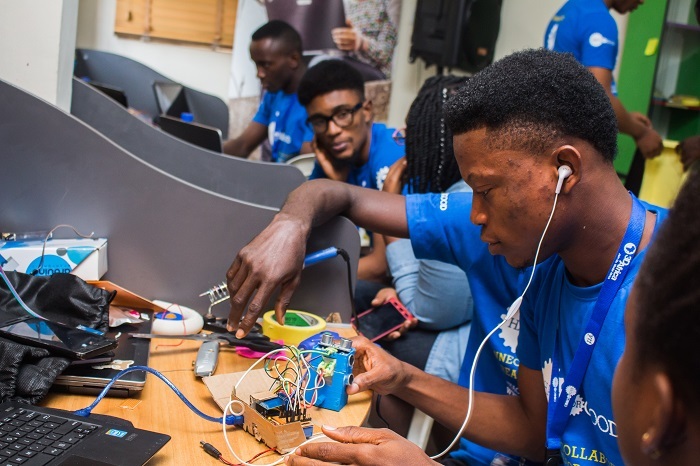 Divided into eight teams, the participants conceived ideas and developed prototypes to solve problems in specific sectors, namely health, agriculture, security, and transportation with the help of a 3D printer. These prototypes were pitched to a jury and judged on the criterium of impact, technology, marketability, and collaboration in terms of teamwork and the pitch. Team Alpha developed a Gesture Controlled Pesticide Spraying Robot (GCPSR) for farmers. The idea and the reason behind it is to reduce health risks for farmers providing them with a better alternative to spraying insecticides, and also to get this done faster. Team Alpha created a robot that detects lines and motions and a glove to control it, to be worn the farmer. This robot detects lines and motions and can be programmed to deal with insect invasion even when the farmer is not there. Their prototype addresses problems in both health and agriculture. Team Rex created the Smart Pathfinder for the blind, an obstacle detecting device that works with a Bluetooth. Apparently, the device, an improvement on the white cane, is developed to aid visually impaired individuals. And also, as the team explained, to help make life easier for those ladened with the responsibility of aiding them. This compact device with ultrasonic sensors only has to be attached to the blind stick/white cane already owned a visually impaired individual to be used. Team Rex hopes that the device can be modified in the future to include a GPS tracker and be voice automated. Team De-void developed a Car Intelligence Security System (CISS) that tackles the problems of car hijacking on the highway. CISS alerts vehicle owners of hijacking incidents in real time. It tracks the car’s location and speed and finally makes it possible to remotely render the car inactive. The device also detects potholes and bumpy areas on highways and visualizes them on a heat map to show susceptible areas simultaneously. CISS utilizes the data of time and locations where car hijackings happen most frequently to intelligently predict red zones and inform vehicles owners of what areas are dangerous and how best to plan their trips. them to the retailer with just a click of a button. As explained the team, farmers in rural communities are rarely tech savvy and unable to use a smartphone. The device created the team only requires farmers to push a button and customers in the city will be notified to go pick up freshly harvested produce. “The idea behind this device is to speed up the food chain process and to help farmers prevent loss or waste. So many farmers lose money from having their produce go bad, especially since they have no storage facilities for their perishable produce.” The device which can be worn on the arm or around the neck is made with an Arduino Uno microcontroller, a sim808 GSM GPS module, LED and buzzer. 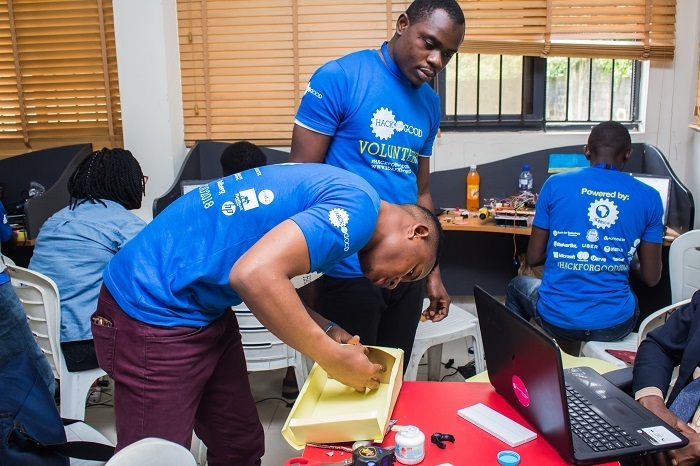 Team IHack developed a fruit scanner that is able to detect spoilage in fruits and vegetables using parameters such as temperature, light, humidity and enzyme activities. The scanner was created using the Arduino UNO board and other incorporated sensors like DHT11 for temperature, LDR for light intensity, MQ3 for alcohol content and LCD. The device seeks to optimize the hygiene of fruits and vegetables, as well as sales reducing wastage. It also reduces the risk of food poisoning caused as a result of deterioration in fruits and vegetables. Team Visioneers developed a smart glass and walking aid for the visually impaired. The smart glass converts text to speech to aid with reading, while the walking aid, a handheld device acts as a guide vibrating when obstacles are detected. 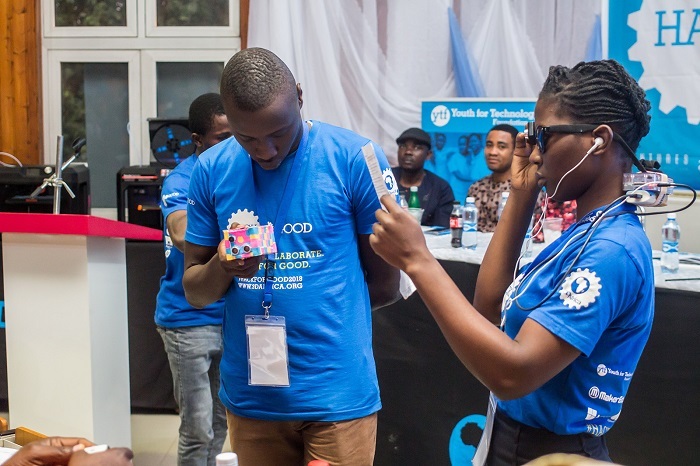 “The prototype targets the health sector in the sense that we are looking at helping the visually impaired to read and walk about in the house and on the street without bumping into obstacles there boosting their confidence like every normal person,” the team explained. Team Pentacorp created a Smart Monitoring System (SMS), a device that detects gas leakage in homes while monitoring intrusion incidence. When the SMS is installed and activated, the sensors become operative. If a gas leakage occurs, the sensor detects it, an LED display comes on periodically while the buzzer sounds an alarm, and a notification is sent to the owner’s phone and the fire service. All this happen simultaneously and in real time. The same sequence follows in the case of a break-in however, the notification will be sent to the security operatives and not the fire service. The cards can be converted to cash through direct debit into the commuter’s account and will be in different denominations. 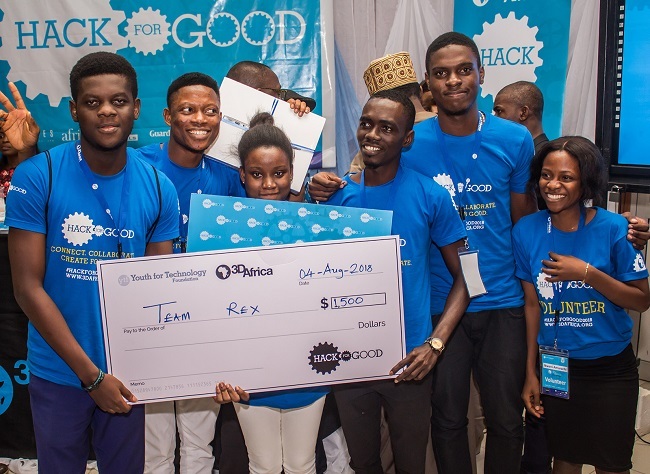 At the end of Saturday, Team Rex emerged as winners of the competition with their Smart Pathfinder. The team left with a prize money of $1500, an equivalent of over N500,000. 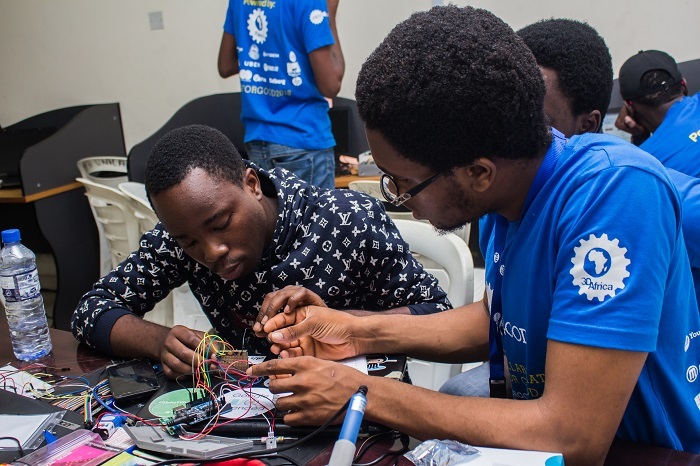 Speaking to Ventures Africa during the ‘Hack till you drop’ session, Day 2 of the event, Emmanuel Odunlade, past winner, and current mentor at the event said he is impressed with the ideas and the prototypes that the teams came up with. 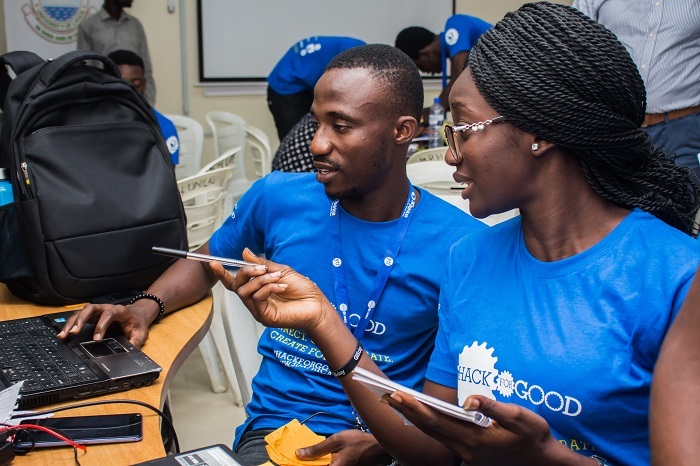 “Many of the participants have quite the vision and it almost seems like fantasy, but it is great to witness where their minds can take them.” He also encouraged them to come up with sustainable solutions that can be built on post the HackforGood event. 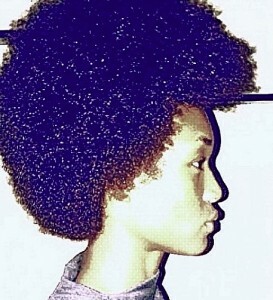 “One thing I always tell them is that whatever they develop, they should develop with thoughts beyond the event. They shouldn’t come up with lofty ideas just to win the prize,” he said.